For most of us watch collectors and enthusiasts, watchmakers are something special. We see white coats, clean and laboratory-like environments, small loupes and even smaller parts. In the big world outside of our domain of luxury watches, people probably don’t even know what a watchmaker does these days. To us, watchmakers are like rock stars. Some of them even seem to have groupies. Most of the time you read about watchmakers, they are either independent watchmakers or not mentioned by name. A lot of big name brands have certain people that they want to push forward to the media, not the actual watchmakers who make sure your watch is working perfectly. Girard-Perregaux seems to break that rule and introduces a few of their young watchmakers to you. Like Jean-Luc Borel, he is a watchmaker at GP and plays the Alphorn in his spare time. 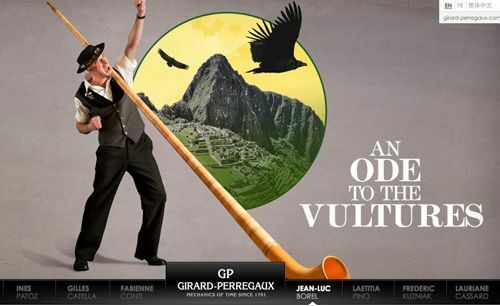 Actually, some years ago, he won the Alphorn World Championship. GP zooms in on a few of their young watchmakers are let them introduce themselves to you. All this is part of a program from GP that is being called ‘The Girard-Perregaux Young Watchmakers Tour‘ where you can meet with them, discuss with them and participate in one-on-one workshops. The tour starts in New York and will also be held in Beijing, Paris and several other cities around the world. More information can be found at www.thenewfaceoftradition.com.